Q. What type of transaction window should I use? A. Aluminum sliders don’t hold up with heavy traffic. We recommend all- steel, sliding, top hung ball bearing roller windows. Q. Can we locate the doors and windows where we want them? Do they have to come where they’re shown in the brochure? A. We put them where you want them considering where they’ll work best. Q. Can we change the size of the booth? A. Yes, we are a custom manufacturer. Q. Can we use our own color? A. Yes, we can color match to virtually any color if it is not found in our color chart. Q. Do I have to specify the booth location as interior or exterior? A. No. All B.I.G. booths are designed and engineered for exterior use. Q. Do the doors come with locks? Q. Can the lock be changed to another style or manufacturer? Q. Your brochure shows specific booth sizes. Can the size be changed but keep the same appearance? Q. Can a booth shown in the brochure be made to be bullet resistant? Q. Does B.I.G. have a rep near my location? A. No. B.I.G. is factory direct to you. We can take all information and provide pricing with a simple phone call. We have done it this way for 30 years. A. B.I.G. 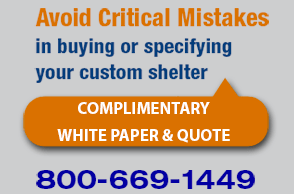 custom manufactures every booth according to your needs and site requirements. Typical booths range from 3'x3' to 12'x24'. If we can send it by truck, we will make it. Q. What assembly is required when I get the booth? A. None. 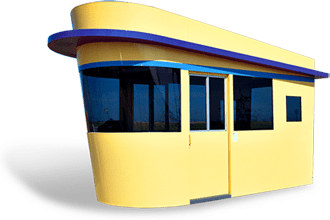 All booths are heavy-duty, welded, steel construction, pre-painted, electrically wired, ready to fasten to your location and connect to your power. Q. How hard is it to install the booth? A. Booths arrive at your site on a flat bed truck to be off-loaded by your forklift or crane, placed on your pad and then bolt to the concrete with expansion-type bolts. A. Yes. We stand behind our workmanship and provide you with a written warranty. It comes with every product. Q. What colors are offered? A. B.I.G. will provide its standard color chart, but if you provide a color chip, we can computer color match almost any color for you. A. No. Because we custom manufacture every product in almost every size and shape, and with so many options, a price list would be impossible. A simple phone call to our sales people is all you need do. They can provide a price for you right over the phone. Q. Do your booths meet Code? A. Yes. Our products have been installed in virtually every North American city as well as off the continent. All B.I.G. booths are manufactured to I.B.C, all electrical components are U.L. approved and booths are wired to N.E.C. code. We are aware of most City & State codes, so let us know the City your booth will be installed in, and we will research it and comment back. B.I.G. is a member of ASIS, BOMA, NFPA, ECOSA, IPI, NPA & PAC. We have manufactured our products for over 40 years. We know our business. Q. Does your booth meet ADA? A. Yes. All of our booth designs can be made to comply with ADA; we know the disabled access code requirements and can help you. Q. What is the typical electric load in a booth? A. The typical amp draw would be 30 amps. This includes: 1-air conditioner, 1-heater, lights and 2-duplex outlets. We suggest 40-amp service. When ordering your booth, tell us if you need special electric and we will provide it.